The determination of Acetic Acid is important in some categories of beer and in the identification of organ-olfactory defects. 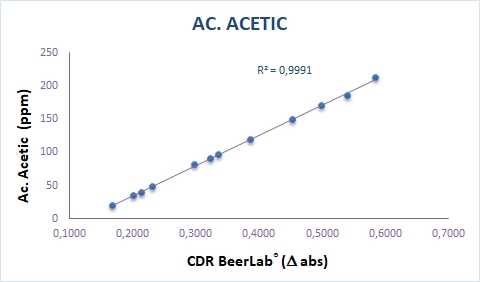 With CDR BeerLab® you can perform a quantitative analysis of the acetic acid in beer with a simple photometric method, working on beer as it is or wort avoiding laborious treatments. Acetic Acid levels can be measured using CDR BeerLab®, a system which enables you to carry out a wide panel of chemical analyses on beer and water, using a single instrument, in a process that is faster and simpler than traditional methods. With CDR BeerLab® brewers and breweries of any size can carry out brewing process controls in-house without having to rely on external laboratories. Acetic acid can be produced by several yeasts and bacteria present in some categories of beer. It may form during fermentation, secondary product, or during storage due to the deterioration of finished wine. Wort: For an accurate and repeatable analysis on wort the sample must be degassed with the appropriate ultrasonic bath and centrifuged with the mini centrifuge to separate the solid particulate present in the solution. Beer: Take the sample as it is, possibly degas with the appropriate ultrasound bath. Acetic acid was last modified: February 19th, 2019 by CDR s.r.l.